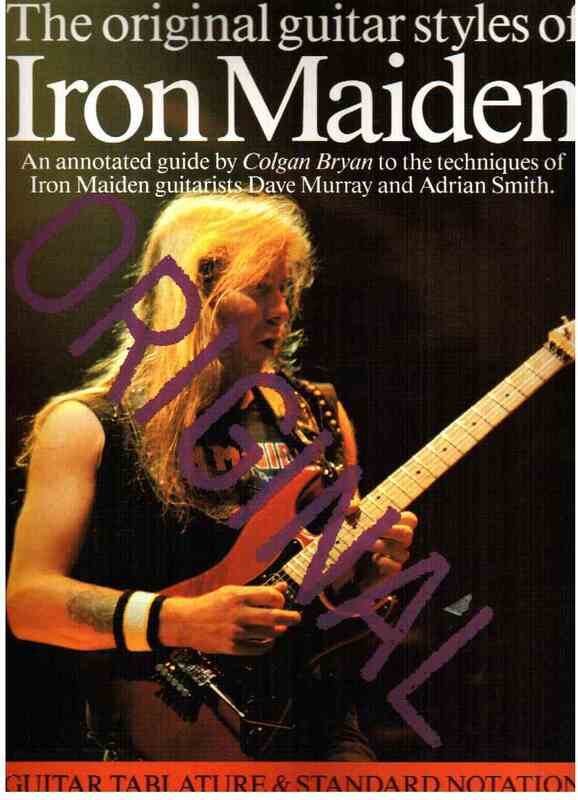 IRON MAIDEN, GUITAR TAB . SHEET MUSIC BOOK WITH GUITAR TABLATURE. LIBRO DI MUSICA HEAVY METAL. 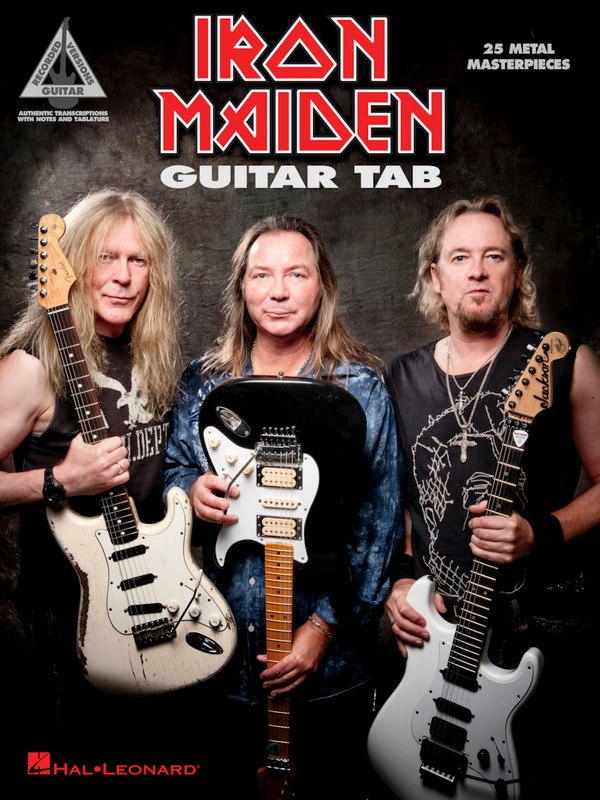 25 authentic transcriptions with notes and tablature from the extensive career of these British metal masters that first came onto the scene in 1975. Songs: Aces High • Blood Brothers • Can I Play with Madness • Caught Somewhere in Time • Children of the Damned • Dance of Death • Fear of the Dark • Hallowed Be Thy Name • Iron Maiden • The Number of the Beast • The Phantom of the Opera • Powerslave • The Prisoner • Run to the Hills • Running Free • Seventh Son of a Seventh Son • Stranger in a Strange Land • The Trooper • 22, Acacia Ave. • Two Minutes to Midnight • Wasted Years • Wasting Love • Where Eagles Dare • Wicker Man • Wrathchild. SPARTITI PER VOCE E CHITARRA. Note-for-note guitar transcriptions for the band's bestselling 2010 release featuring 10 tracks: The Alchemist • Coming Home • El Dorado • Isle of Avalon • The Man Who Would Be King • Mother of Mercy • Satellite 15...The Final Frontier • Starblind • The Talisman • When the Wild Wind Blow. IRON MAIDEN, A REAL LIVE ONE. La storia del più originale gruppo inglese, creatore di melodie a ritmo incalzante della scena Heavy Metal degli anni '80, comincia nel 1976 nella periferia Londinese, con l'allora diciannovenne bassista Steve Harris. Il mostraccio che campeggia nei loro live-act e nelle copertine dei loro album e che ha portato tanta gloria e fortuna agli Iron, è uscito dalla macabra matita del disegnatore Derek Riggs. Contiene: afraid to shoot strangers -be quick or be dead -bring your daughter..to the slaughter -can I play with the madness -the clairvoyant -the evil that men do -fear of the dark -from here to eternity -heaven can wait -tailgunner -wasting love. TAB. 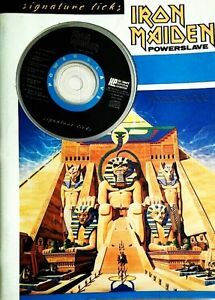 IRON MAIDEN, POWERSLAVE LICKS. Radiografia dell'album degli Iron "Powerslave", ogni fraseggio è scannerizzato e sezionato, ogni parte è analizzata attentamente al microscopio, schedata, e descritta lungamente nel referto del medico per la prima e la seconda chitarra. Per chi vuole prendere un Master di specializzazione in Dr. "maidentologia". Inclusa l'interpretazione musicale del poema visionario "Rime of ancient mariner ", ovvero, "La ballata del vecchio marinaio", del grande poeta romantico inglese Samuel Taylor Coleridge (12 ottobre 1772 Ottery St. Mary, Devonshire -Highgate Londra 1834). Il regista cinematografico inglese Ken Russel (quello dell'opera rock "Tommy", degli Who) ha realizzato un breve film sulla sua travagliata vita. "E presto intesi la romba d'un vento: Non c'investiva, Ma col suo solo suono squasso' le vele, Tanto fruste e secche. Sopra il mio capo l'aria si commosse! E s'accesero cento luminarie Che facevano in cielo l'altalena! In mezzo a quelle, a sinistra e a destra, Ballavan pure le cineree stelle." S.T. Coleridge, da "La Ballata del vecchio marinaio". Durata del CD 53'54". Contiene: aces high -back in the village -the duellist -flash of the blade -losfer words (big 'Orra) -powerslave -rime of ancient mariner -2 minuts to midnight. CD TAB. 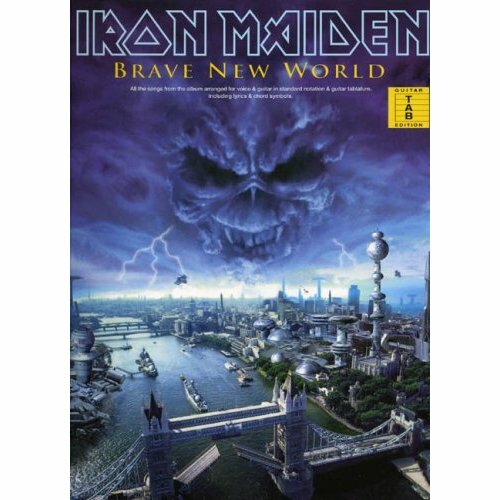 IRON MAIDEN, BRAVE NEW WORLD. The wicker man -ghost of the navigator -brave new world -blood brothers -the mercenary -dream of mirrors -the fallen angel -the nomad -out of the silent planet -the thin line between love hate. TAB. 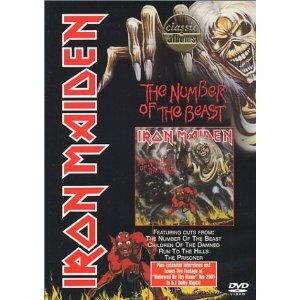 A four-album anthology covering Killers, Iron Maiden, The Number of the Beast and Piece of Mind. The 37 titles include: The Ides of March * Murders in the Rue Morgue * Prodigal Son * Strange World * Charlotte the Harlot * Invaders * Hallowed Be Thy Name * Where Eagles Dare * Revelations * Quest for Fire. got to be dedicated and stick to your guns." compiled by requests! 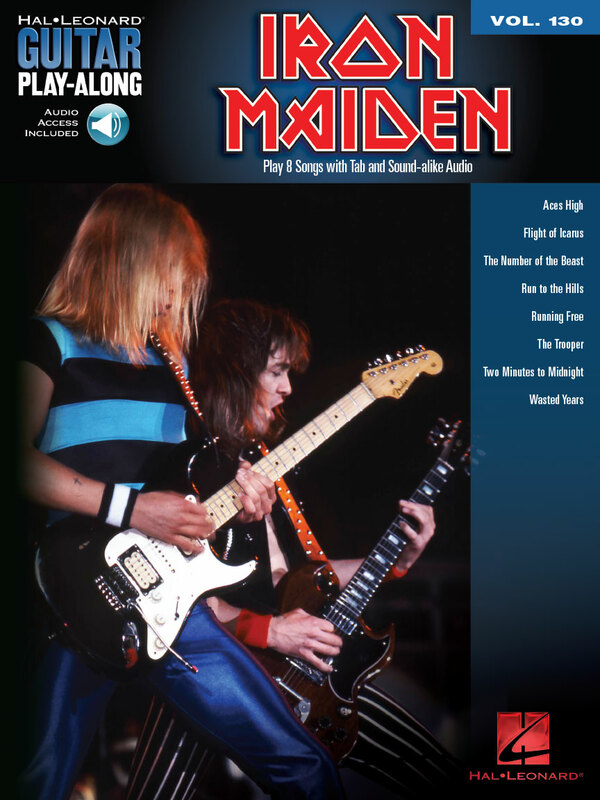 Maiden was off and running. together to start a heavy metal dynasty on vinyl. precision of execution captured on record, that this book is dedicated to sharing. 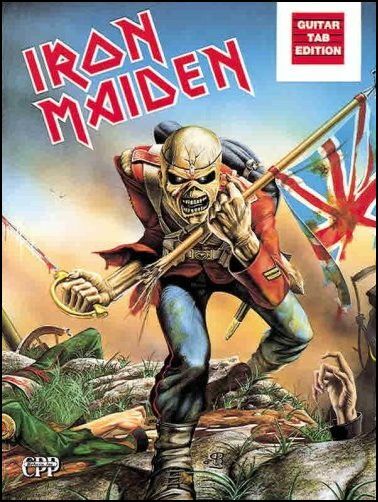 John: Iron Maiden got its first real push forward with the song Prowler. number one just from the requests for the demo tape. record and the original on the tape? John: Was Prowler composed in pieces and put together? Steve: That's pretty much the style of a lot of our songs. possibly switch sections with other songs? could possibly have been used in other songs. devices. I'm thinking of the slow start that builds up. slow parts of this one I think there is that extra measure. are written on the bass. John: Do you start with a melody and fill in with the chords? when I put a riff to the main drum beat by Doug Sampson. He was the drummer on the Sound house Tapes. worked up from a bunch of bits I wrote. John: It's certainly not based on the blues. the blues. I was into blues influenced bands like Free. John: There's no improv in this song. Steve: We thought we'd try and do something a bit different. John: Next up is Phantom of the Opera. Steve: That's a very long song that was done in sections. felt right to go, from the slow part into the middle section. never bothered to write lyrics for it. bring it back in the future. John: Sanctuary is a straight ahead rock and roller. number. We still play it. John: Next up is the famous Charlotte the Harlot. something a bit different than I would write. this makes it pretty special. Interview: Recording And Equipment . Phantom Of The Opera . Murders In The Rue Morgue . Children Of The Damned . The Number Of The Beast . Run To The Hills . Hallowed Be Thy Name . Die With Your Boots On . To Tame A Land . 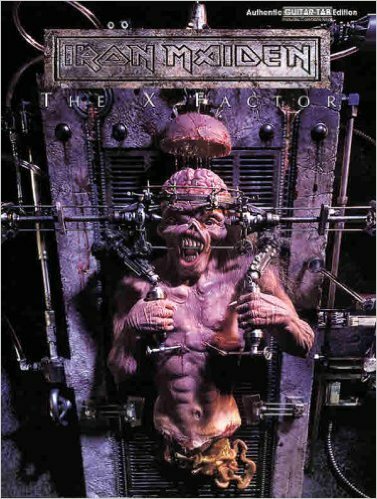 IRON MAIDEN, THE X FACTOR. TAB.